So seeing as it was the first day of Autumn this week - I thought I would TRY porridge again. You see.... well, I just don't like it. I think like Marmite, you either love it or hate it OR your force yourself to like it, knowing it's good for you, then you kinda grow to like it... a little bit. 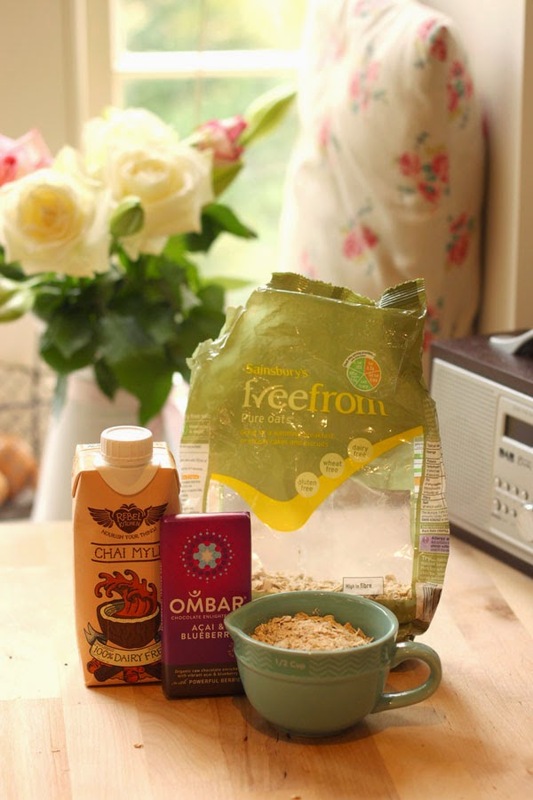 Anyway, I was sent some goodies from the amazing Rebel Kitchen and Ombar Chocolate so I thought it would only be right to make a yummy chocolatey chai porridge and see if that does change things for me. 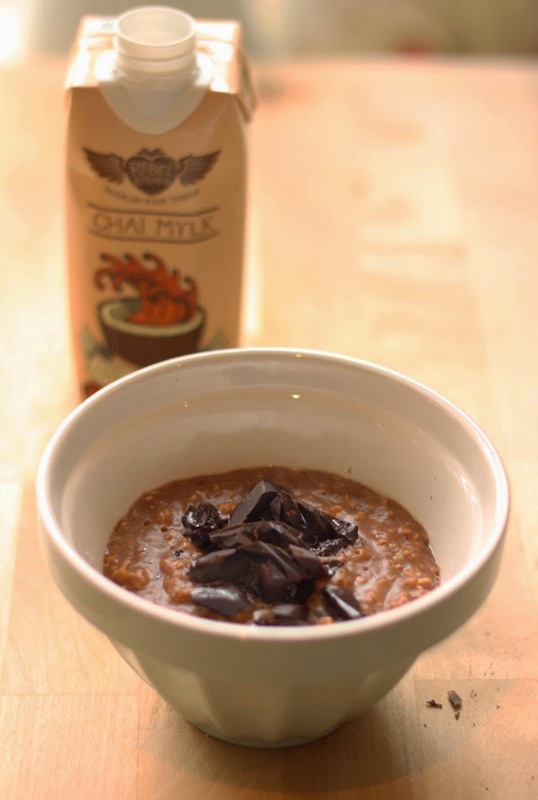 So what you will need is one carton of Chai Mylk by Rebel Kitchen, some oats (I used gluten free) & a 2 squares of Ombar Chocolate - I used the Blueberry and Acai for extra superfoodiness ! 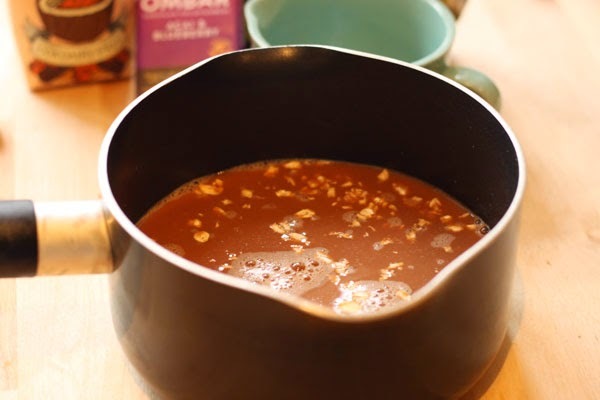 So pop half a cup of oats in your saucepan and add pretty much the whole carton, I added a cup first and it left a little bit which I just drank ! Ooh it's just SO yummy ! Then slowly heat on the hob until its all 'porridge like', keeping an eye on it so it doesn't boil or even worse burn and then pop in your bowl. Cut the chocolate or make shavings and sprinkle on the top ! This slowly melts in to the porridge which is YUMMY ! So my feelings HAVE changed towards porridge.... but only when delicious Mylks are involved and a lovely piece of raw chocolate ! It's just SO good for you too... you can use any of the Rebel Kitchen Mylks to change it up a bit if you like, I might try the Orange Chocolate next... ! They are just full of goodness, check out their website for full ingredients in each but they are predominately coconut milk so dairy free which is good for those with an intolerance. 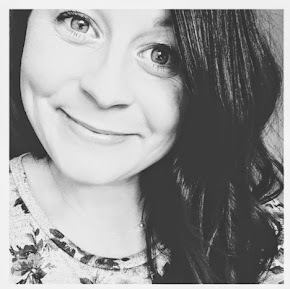 Let me know if you try this and I really can't recommend their Mylks enough - they are all delicious and my favourite is the chocolate as is tastes JUST like old school chocolate milkshake ! YUMMY. Some of the Mylks are now available in Waitrose or you buy them online here - they also do a pack where you can try one of each so that's what I started with ! Now I buy mainly the kids ones as they are a perfect size! I also hear they are on offer in Wholefoods at the moment if you are lucky enough to have one near you ! Ombar Chocolate is available in most health food shops but you can also buy online here. I LOVE their Coco Mylk one, the blue one - it's amazing and SO creamy ! How can chocolate taste SO good and be good for you ? It's like a dream ! 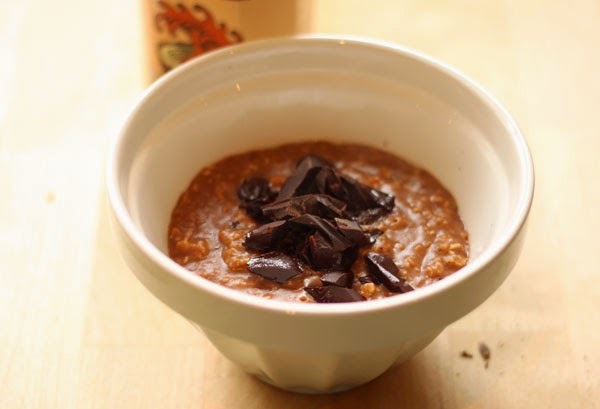 Thanks for reading and let me know in the comments if you love or hate porridge and if this has inspired you to try it ? * This is not a sponsored post but I was sent some samples to try and they are products I will continue to buy myself as I LOVE them.